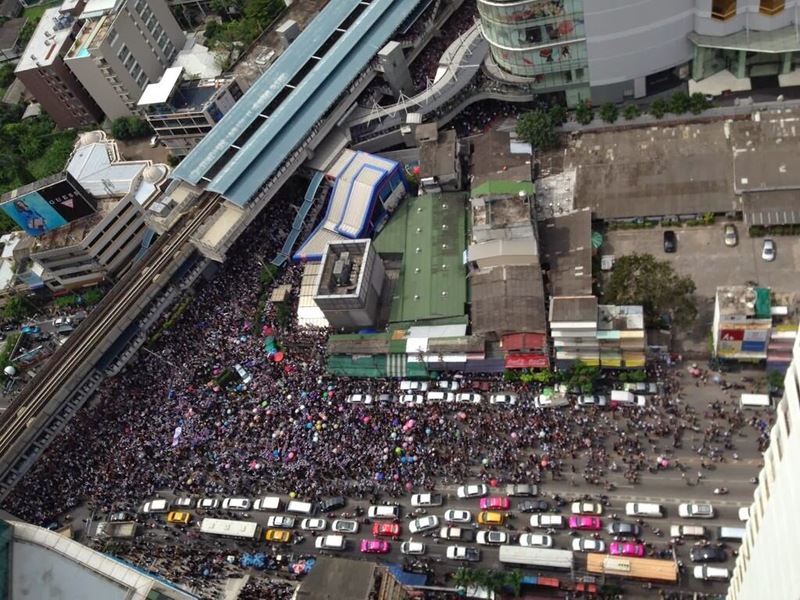 Images: Scenes taken from across Bangkok showing masses of people protesting the current government in Thailand. 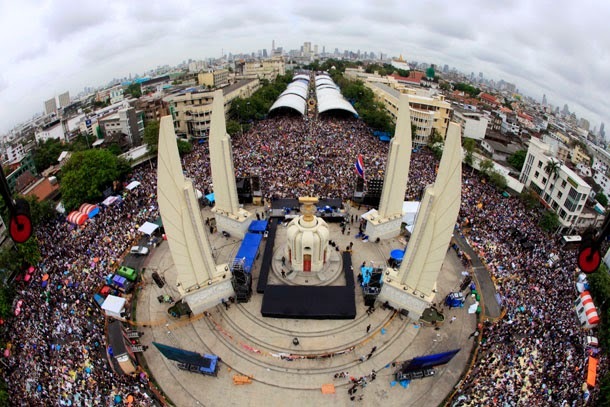 Unlike the government’s mobs of “red shirts” centrally directed by Thaksin Shinawatra himself, these rallies are led by a myriad of leaders and interest groups, from unions to political parties and media personalities. 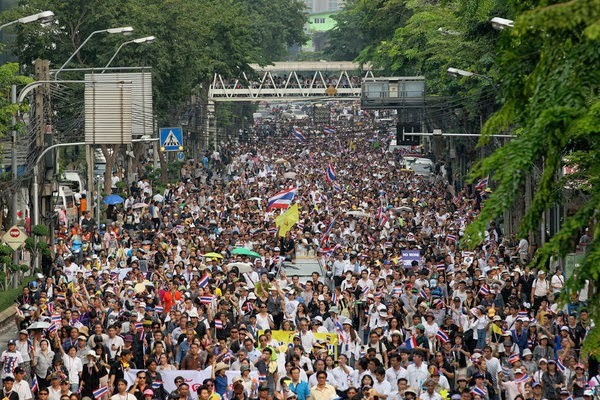 The numbers now present dwarf any effort by Thaksin and his political machine to fill the streets with supporters. Currently, the “red shirts” have failed to fill even a quarter of a nearby stadium, after two earlier abortive attempts to raise a counter-rally. The current government of Thailand is being openly run by a convicted criminal, Thaksin Shinawatra, who is hiding abroad and running the country through his own sister, Yingluck Shinawatra and his vast political machine, the “Peua Thai Party” (PTP). PTP is augmented by street mobs donning bright red shirts, earning them the title, the “red shirts,” as well as a myriad of foreign-funded NGOs and propaganda fronts. While it would seem like an open and shut case, regarding the illegitimacy of the current government, Western nations have urged protesters to observe the “rule of law” and have condemned protesters taking over government ministry buildings. Why is the West now seemingly defending the current Thai government, after nearly 3 years of backing protests around the world against other governments it claimed were overtly corrupt and despotic? It is very simple. Unlike in Egypt, Tunisia, Syria, Russia, Yemen, Libya, Malaysia, and elsewhere where the West has backed protests, the current government in Thailand is a creation of and a servant to the corporate financier interests of Wall Street and London. Regardless of the cartoonish nepotism of a nation run by the sister of a ousted dictator, media in the West continues to portray the current Thai government as legitimate, “elected,” and “democratic.” Thaksin Shinawatra’s egregious crimes while in office are buried in articles, or worse yet, never mentioned at all. 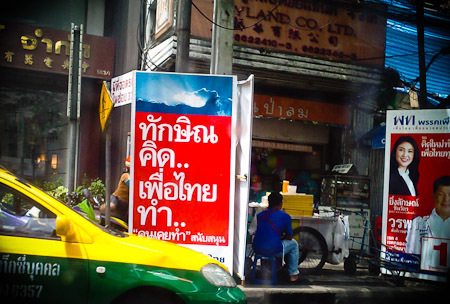 Image: As mentioned in a myriad of foreign media publications, Thaksin’s proxy party ran with the slogan, “Thaksin thinks, Peua Thai does.” As Peua Thai faces charges that a convicted criminal was directly involved in their election campaign, many of the exhibits used against them in court will be of their own design and impossible to deny. 1. Who Really Leads Thailand’s Current Government? 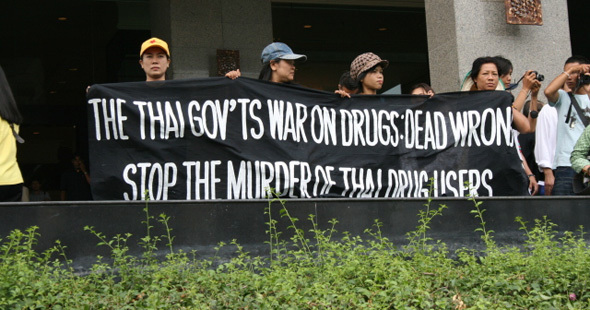 Image: “The Thai Gov’ts War on Drugs: Dead Wrong. Stop the Murder of Thai Drug Users.” During Thaksin Shinwatra’s 2003 “War on Drugs” it wasn’t only drug users who were brutally, extra-judicially murdered in the streets, but over 50% of the 2,800 killed during the course of 3 months, were completely innocent, involved in no way with either drug use or trade. Video: Almost satirical in nature, US Neo-Conservative Kenneth Adelman attacks the Thai government, accusing it of “slouching toward Burma” after his PR firm Edelman took on the ousted despot Thaksin Shinawatra as a lobbying client in 2007. The next year, elections would be held and easily won by Thaksin’s unassailable populist-built voting bloc. 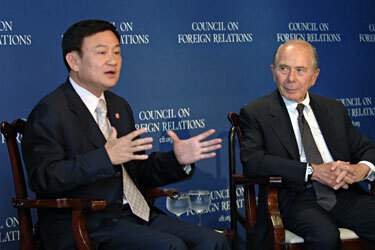 The prime minister very publicly ran as “Thaksin’s nominee” as was described in Time’s article “Thailand’s PM Proxy: Samak.” However, both he and his successor Somchai Wongsawat (Thaksin’s brother-in-law) would be quickly ushered out of power through a combination of corruption charges and “counter-color revolutions” staged by elements within Thailand’s indigenous establishment. Beginning in 2009, Thaksin’s political front began a campaign of increasingly violent confrontations with the prevailing Thai establishment. 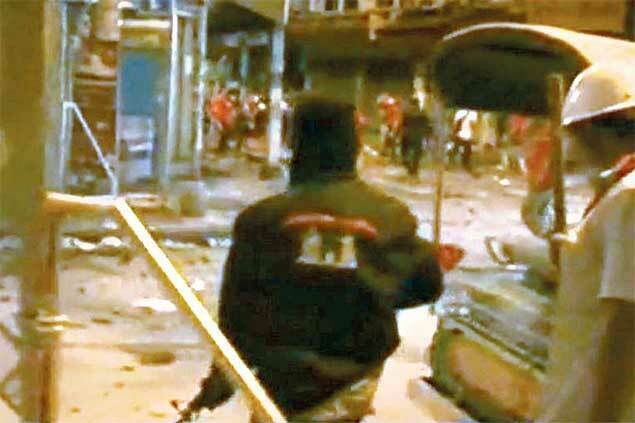 During April of 2009, protests staged by Thaksin’s UDD “red shirts” would leave widespread property damage and 2 dead by-standers gunned down while trying defend their property from looting protesters. The Thai military was successful at dispersing the riot without killing a single protester. Thaksin’s political lieutenants would flee to Cambodia after making calls for a “people’s war” that went unheeded by the vast majority of the Thai population. In 2010, intent on generating enough domestic and international outrage to topple the Thai establishment, some 300 covert militants were brought in to trigger deadly violence that would last weeks, turning parts of Thailand’s capital of Bangkok into a war zone. Over 90 people would die, including soldiers, police, innocent by-standers, as well as protesters themselves cut down by both crossfire between militants and soldiers, and smoke inhalation while looting buildings fellow protesters had lit ablaze. While the Thai military succeeded in restoring order across the city, Thaksin and his Western backers had the momentum they needed to continue radicalizing the UDD “red shirts” as well as turn international opinion against Thailand – bringing us to the 2011 elections. Running on a campaign of promising cheap houses and cars, free computers, the eradication of both flooding and droughts, as well as guaranteed prices for rice grown by Thailand’s many rice farmers, Peua Thai easily won yet another election – providing a perfect example of how Western-backed client regimes are more than glad to use populism to co-opt large segments of a targeted nation’s population, if national leaders themselves are not willing to first (e.g. Argentina, Venezuela). With an accused mass-murderer, convicted criminal hiding abroad to evade multiple arrest warrants, openly running the government through his own sister, and none of his Peua Thai campaign promises being kept after over 2 years in power, Thailand’s establishment may feel the timing is right to begin apply pressure that will ultimately oust Thaksin from power once again – perhaps once and for all. Image: Figure 1. From SSI’s 2006 “String of Pearls” report detailing a strategy of containment for China. While “democracy,” “freedom,” and “human rights” will mask the ascension of Western aligned client regimes into power, it is part of a region-wide campaign to overthrow nationalist elements and install client regimes in order to encircle and contain China. Violence in areas like Sittwe, Rakhine Myanmar, or Gwadar Baluchistan Pakistan, are not coincidences and documented evidence indicates immense Western backing for armed opposition groups. 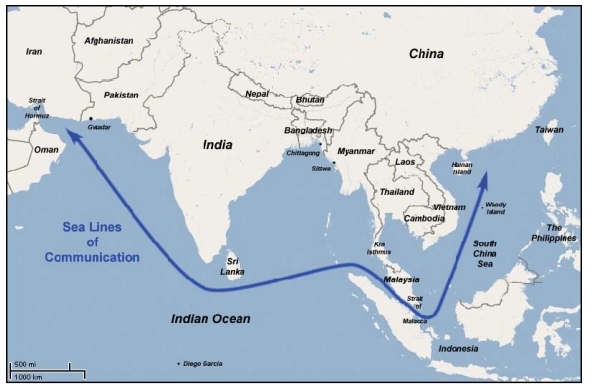 This would be further expanded on in the Strategic Studies Institute’s 2006 “String of Pearls” report where specific areas of Chinese expansion were identified for disruption and containment. This included the now destabilized Baluchistan region in Pakistan where China’s Gwadar port sits, as well as the destabilized state of Rakhine in Myanmar. Leading a Thailand fully complicit with the United States and its neo-imperial ambition to sustain another century of American hegemony across Asia is a role Thaksin Shinawatra was groomed for decades to fulfill, and it is precisely for this reason that so much money, time, and effort has been poured into both propping him up, while tearing down Thailand’s existing indigenous institutions. Undoubtedly opposition political parties will benefit from any protest and are most likely involved to one degree or another. Additionally, Thai business conglomerates, Thai media moguls, and the military at the very least tacitly approve the current demonstrations. Many across the silent majority are opposed to the disruptive street demonstrations conducted by both Thaksin and his Western backers, as well as his opponents in Thailand and support neither political party – but find Thaksin and the acute instability and division he has created unacceptable. 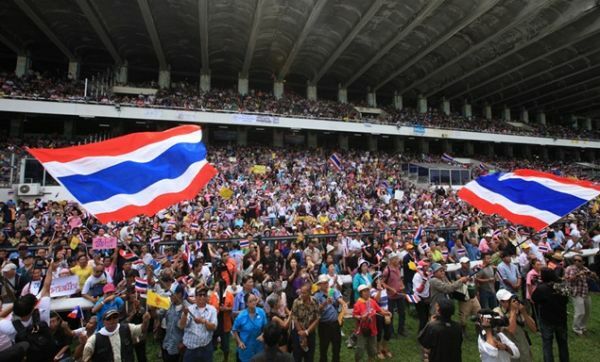 Image: October 28, 2012, an initial gathering of anti-government protesters assembled in a stadium to call on PTP to step down from power. Despite the “spring” theme of 2011-2012, the rally failed to make any international headlines – most likely because this movement seeks to unseat a Western client-regime, not install one. The rank and file of the protests themselves may include political opposition party supporters, groups aligned to media mogul Sondhi Limthongkul’s “People’s Alliance for Democracy” (PAD), as well as many from across the silent majority, both lower and middle working class, who would like to see an end to Thaksin’s corrosive influence on the country once and for all. 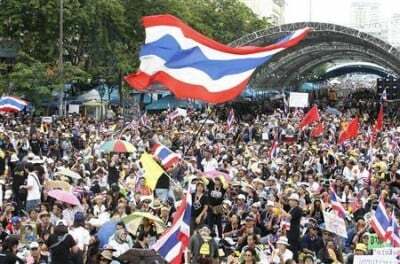 Similar protests in 2007 were initiated by Sondhi’s PAD movement, but later joined by labor unions who cooperated in closing down Thailand’s airports in an act of noncompliance against Thaksin’s proxy government, succeeding in finally collapsing the regime. While it is claimed that there is a distinct divide between the middle class and poor in Thailand, and that the latter fully support Thaksin Shinawatra and his populist policies, in reality his party won the 2011 elections with a mere 32% of all eligible voters, and failed to achieve even a popular majority of those who did bother to vote – this even with fantastical campaign promises, rampant vote buying, and organized transportation provided on polling day by Peua Thai’s vast upcountry political machine. Ultimately, the Thais who come out to protest Wall Street-proxy Thaksin Shinawatra are not protesting him because they approve of the alternative. On the contrary – whoever takes his and his political machine’s place will have an equally indefensible mandate to do as they will with the nation, its resources, and its people as Thaksin has. If and when Thaksin and the cancerous political machine he has created with foreign funding and expertise is excised from Thailand’s political landscape, something entirely new will have to be put in its place if progress it to be made.